In April 2014, former AIM volunteer coordinator and musician, Ferol Carytsas, set the goal to launch a UF Health music ensemble within the next three years. 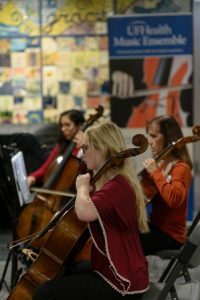 She was inspired by similar programs at the University of Michigan and Duke University and used them as a reference for establishing the UF Health music ensemble. Recognizing that so many medical professionals have a background in the arts, Ferol contacted UF Health Communications and began a recruitment campaign among staff. Her first recruit was Linda Morris, M.S.N., R.N., NE-BC, a UF Health Shands Hospital SAGE nurse. Recruitment efforts were slow, but in the course of a year, Ferol was able to recruit ten musicians consisting of UF Health faculty, staff, students and alumni. In May 2016, the UF Health music ensemble debuted a program featuring works from Vivaldi to Coldplay. Since their first performance, they have presented two concerts a semester.